I’m not sure if I have fond memories of Poppets – they were usually found in the racks of cinema foyers, overpriced and never as good as a bag of Revels. But they obviously made a mark on some people, as demand has forced their return – in suitably retro packaging. Yes, the boxed sweets are back in the shops in four flavours – toffee, mint, raisin and orange – and the boxes feature what the company describe as "iconic images". 16 in total – some are extremely naff – Rubik’s Cubes, lava lamps and the Natwest piggy banks for example – but you can’t beat a box of sweets with a Lambretta scooter or a Mini on it. You should find them in most retails outlets and supermarkets in the UK, priced around 35p per carton. After reading this i did a google search for retro sweets and theres lots! 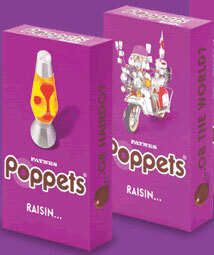 I liked http://www.britishcandy.com and http://www.retrosweets.co.uk best, Britishcandy.com have got poppets…mmmmm! !